There are many things to consider when purchasing and customizing steel buildings in North Carolina. Our warm, humid climate in the spring and summer can easily give way to termites and other pests, which is why steel is often the recommended choice for storage sheds, garages, and buildings that will serve various other purposes. There are also different ways to customize your steel building to ensure it meets your needs, weathers the elements, and stands the test of time. Here are some of the options available on our metal buildings that you’ll want to think about when beginning your project. #1. Size. This will depend on your building’s intended purpose and should be one of the first factors you consider when purchasing a metal building in Charlotte NC. How large of a space will you need? If it’s a small storage shed or a workshop, and you’re on a tight budget, then you may be looking for something small. Also consider placement. How large of a building can you accommodate on your property, and where will it go. Will it be placed far away from your home or close to it? #3. Roof styles. There are several different roof styles you can choose from for metal buildings, and the options will differ depending on the building’s intended use. A barn or cottage-style building will have a different roof style from an industrial or warehouse building, for example. When you call us for an estimate on your steel building in North Carolina, we’ll help you wade through these options as well. #4. Type of steel framing. We use high-quality tubular steel or red iron steel for our metal buildings, and the type you choose will again depend on the size of your building and its intended use. Tubular steel buildings are best for smaller operations such as metal garages, metal carports, or metal workshops, while red irons steel buildings are best for industrial, warehousing, commercial, or other large operations that require more space. Both options are relatively lightweight and extremely durable, but red iron steel framing is heavier, which is why it’s usually recommended for larger steel buildings. No matter what, you want something that will be able to withstand the elements, especially with the severe thunder and hail storms that our Carolina climate is known for! #5. Windows & Doors. Again, depending on the intended use of your metal building, you’ll want to consider the placement of windows and doors for easy access and light penetration. You can also add electricity and insulation if you plan to spend a lot of time inside your building, if, for example, you’ll be using it as a greenhouse, wood workshop, or automobile shop vs. just a simple storage shed that won’t need the extra bells and whistles. 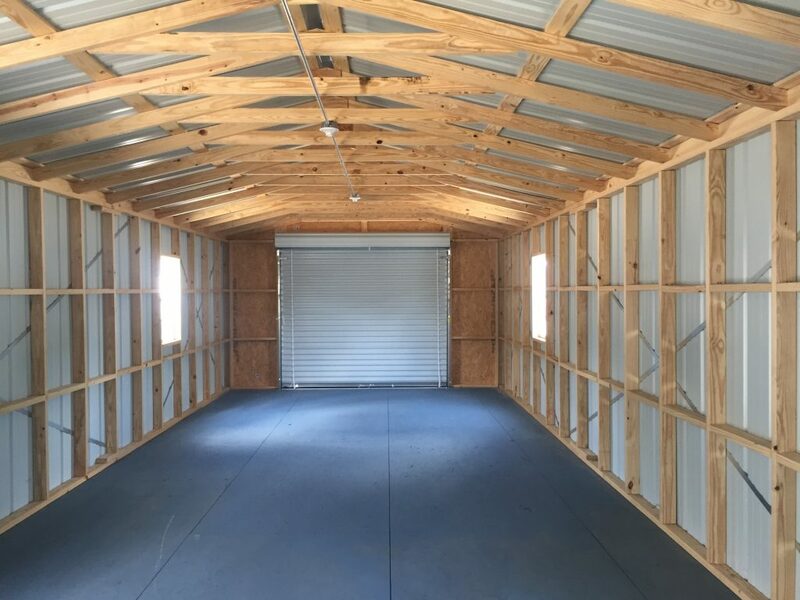 At Metal Buildings Charlotte, we specialize in the construction of prefabricated or pre engineered steel buildings in North Carolina for a variety of purposes. We can help you customize a metal building that will suit your needs and be unique to your individual tastes. Give us a call at (980) 365-6583 to start the estimation process, and let’s get going on your project today!